WOW.......Thats amazing. Not sure if those two guys with the pilot uniform are the real pilots that landed the plane. Not sure if those two guys with the pilot uniform are the real pilots that landed the plane. You're right, they must be stunt doubles. Good job by the pilots. 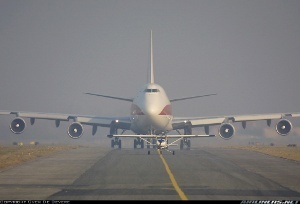 Hey Jon, where did you find that photo on Airliners.net. It is really cool. I wonder how much bigger it would look if it were closer to the cessna. go 747's go go go. Do they have the close-ups where you can still see the missile in the wing? For whatever reason, the link took me to some advertisement for digital photography and smudging. Oh well. I got same result as R2F. You know what's amazing to me, is that the Cessna and the 747 are both born of the Wright Flyer and a lot of ingenuity.